Impact: When creating thousands of network namespaces the delay in executing commands increases exponentially in kernels before 84d17192. Fix: In 84d17192 in the upstream kernel, locking code in fs/namespace.c is greatly improved resulting in much better performance when the number namespaces increase. Testcase: Below, test_ns.sh can be run and a graph can be compared between the existing version and the patched version. Additional Information: Because this is a change in the vfs layer, I ran the xfstests and compared before and after results of this patch. The patch did not create any additional failures in the generic xfstests. cherry-picks because of the amount of deps required to just use cherry-picks. why that solution was chosen. Whenever one enters a network namespace via "ip netns exec foobar somecommand" there is a mount done of the appropriate device on /sys since "somecommand" needs to see namespace specific versions of /sys directories. When the ip process exits these mounts need to be torn down, and that requires a global write lock for vfsmount_lock (this is a single writer multiple reader lock). This has serious performance implications when the number of name spaces increase. The commit 84d17192 addresses this issue, and it is clear by running the attached testcase that it fixes performance issues when dealing with large numbers of namespaces. I've included a graph with the differences in performance between this fix and its parent commit to show the the improve in performance. 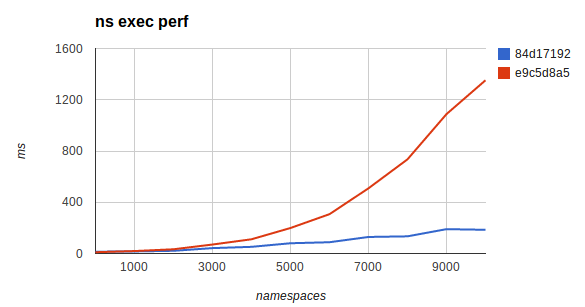 The x-axis represents the number of namespaces and the y-axis is execution time in ms. After applying the patch the performance delays are not exponentially increasing. This affects 3.2/3.5/3.8 series kernels, as it was fixed in 3.10. This script will test performance of 'ip netns exec <ns> /bin/true" when increasing namespaces by 1000. Doing more extensive testing now.